Here comes another outfit proposal for rainy days. The gorgeous building behind me was build in 1898. I'm always enthusiastic about historical building and if I remember well, with this one it was love at first sight. 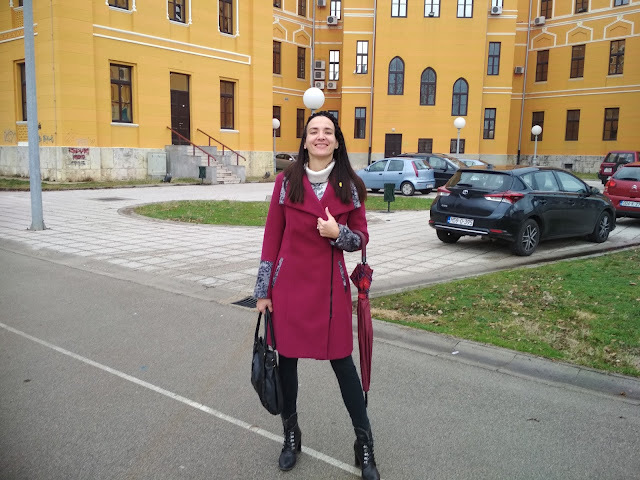 Besides being my favourite historical building in Mostar, this place is also one of Mostar's high schools known as Old Gymnasium or Mostar Gymnasium. In addition, within this building (apart from this high school/gymnasium) you can also find United Worlds College. UWC describes itself as a global movement for education and they have collages all over the world. I'm not sure about how many students this UWC collage has, but the students seem to come from all parts of the world, a really mixed bunch, so I imagine that studying in such an international institution must be fun. The reason why I often hang out here is another institution and that's American corner. First thing that any bookworm does when he or she moves to a new town is to find out where all the libraries are. That is what I did when I moved to Mostar many years ago. I visit the library in American corner fairly often. 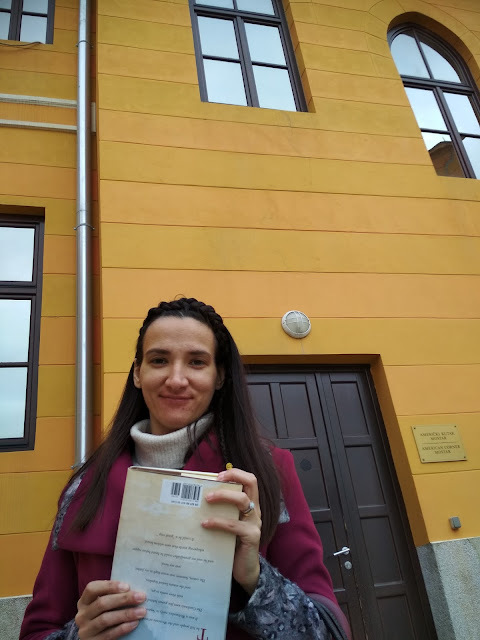 If you are an ex pat living in Mostar and are looking for a nice library, I can totally recommend this place. You can see more photographs of this beautiful historical building here and here. The quality of these photographs isn't so great, but I choose not to edit them because I'm not sure how to go about it. I'm not very good with editing. As I said, I don't really plan my outfit posts. It's more a case of 'my husband sometimes takes my photographs and I sometimes publish them'. As you might have noticed, most of the time I publish outfits I wear for everyday outings, not very glamours events. 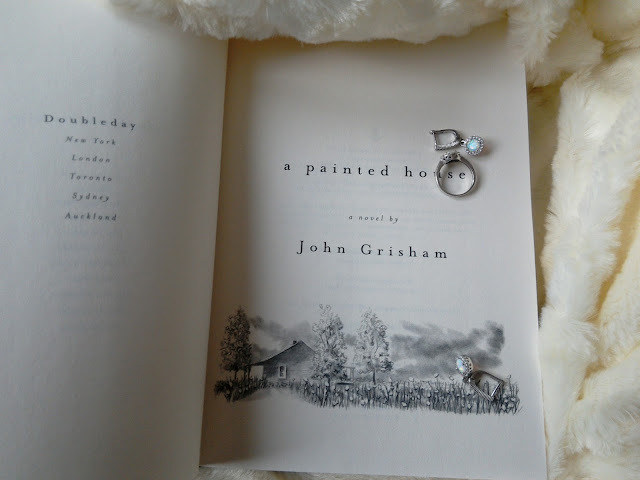 In this case, I went to return A Painted House by John Grisham to the library. 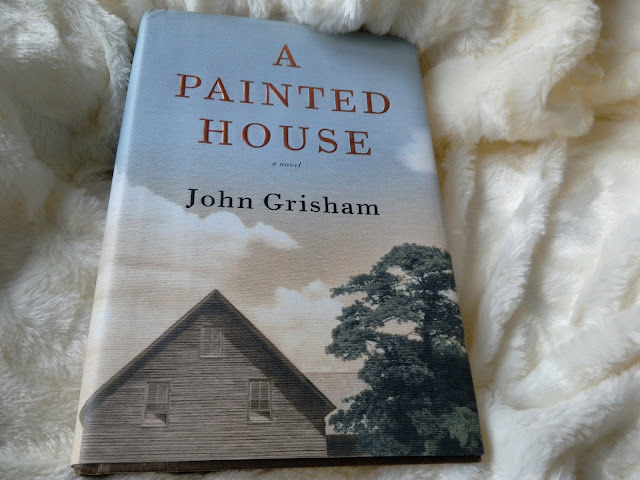 You can read my review of A Painted House here. Obviously, I didn't notice that I was holding this book (or the covers) upside down when we took these photographs. I did read it, it's not a prop for photography purpuses. If you want to read my review of this book, you can do so here. Bittersweet and nostalgic, this novel isn't typical Grisham. As a historical fiction, it works quite well. I thought the plot has some weaknesses, but nothing major. I read it back in January and I quite liked it. I do like Grisham's simple but descriptive style of writing.I think that is what makes his books so suitable for movie adaptations. Seeing these photographs, I keep wondering about what was under my coat. I don't mean that in a weird exhibitions way. I just don't remember what skirt I wore over these leggings. I think I wore a denim skirt over these leggings, but I can't tell for sure since I didn't take any photographs without my coat that day. I always wear something over leggings and most of the time, it's a skirt. I already shared an almost identical on the blog (bad, bad blogger that I am I sometimes repeat outfits), so I won't comment on in. All I'm going to say is that I love this hairdo. A little side braid is simple enough to learn, won't take away much time from you and it can add something extra special to your look. I hardly ever think of hairdos as a way to enhance an outfit, but in reality our hairstyle do play a role in creating the right look. It is when our hairstyle complements our outfits perfectly, that our outfits look well put together. It is something we might forget, but make no mistake. Choosing the right hairstyle can make all the difference. You're right, I think your braided hairstyle looks lovely! I really need to do more with my hair, I'm very unadventurous with it! I just so rarely have the time, haha! I love this coat and the buildings behind you are such a nice colourful backdrop! thank you Mica. I love braided hairstyles. I hope you have a lovely Sunday! The braided hairstyle is lovely and I wish I wasn't so bad at doing hairstyles. I genuinely just can't seem to hold the bits that need holding or do things evenly out smoothly. It looks lovely on you. It's good to know where the libraries are. I haven't visited my new library in my new home town yet but I look forward to doing so. I visited it one when we were viewing the house so I should return! thanks Kezzie, it takes a bit of practice, once you learn it, it gets much easier. I hope you find that library to your liking. It is always great when one finds a nice library with friendly librarians. Beautiful historic building in such a pristine condition! And you know I love your coat. Gorgeous braid and gorgeous endless legs (those pictures a few years back - oh my!). Lots of love, dear! 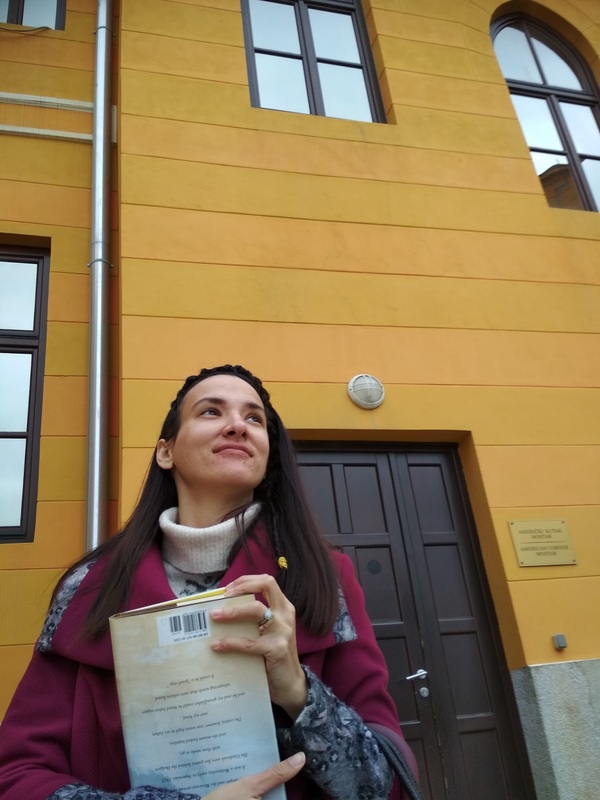 Thank you Natalia, they seem to repaint the building regularly and keep it as close to its original state as possible. Oooh Ivana, I really love how you transmit your daily thoughts to us with outfits, drawings and anecdotes from the real life. Thanks for introducing us little by little to many details of your main city, when I take walks around Barcelona I always think about the use of many buildings! Same as you jeje! 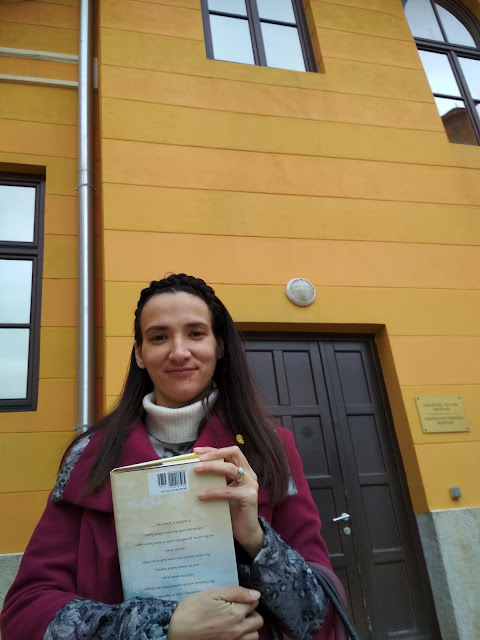 I laughed a lot when you say that you didn't notice you were holding the book in the wrong way, but the photo itself is so casual and spontaneous, it transmits good vibes and all your personality :D I gotta read that book by the way, and I'm currently reading Isabel Allende's "The house of the spirit". 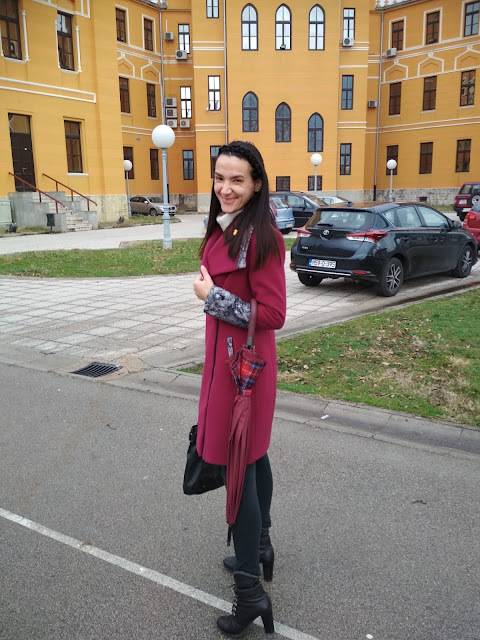 By the way, editing photos is not that hard, is like everything, practice makes perfect so if you want to start with something easy you got many tools available online, I would recommend Canva if you want something easy to work on ;) If you have any doubt I'll be happy to help! 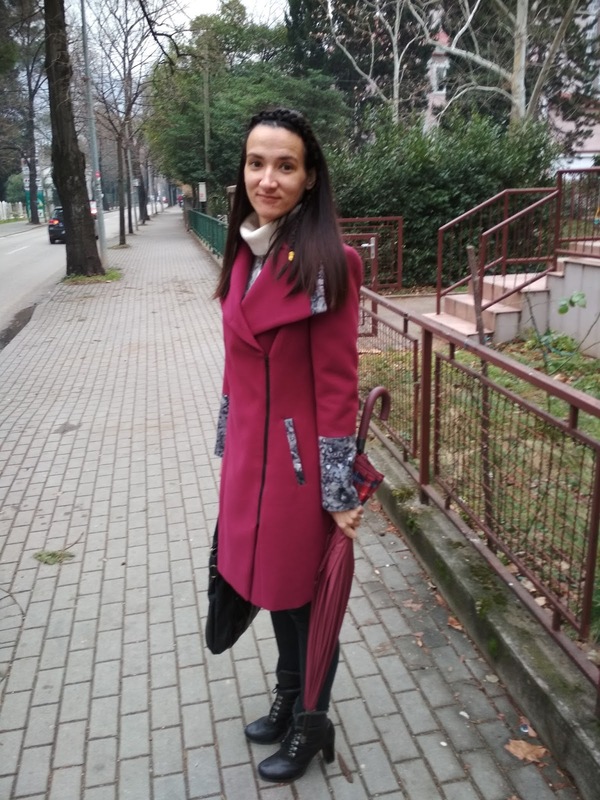 Love your outfit Ivana! Gorgeous coat and boots. The building is very pretty. I've held books & magazines upside down as well. Prava dama, od glave do pete pa jos i sa knjigom u ruci, savrseno! what a great stye my dear! i love this brugundy coat a lot. you look very fab.